This past weekend was one of the most rewarding and soul-fulfilling weekends I've ever had!! 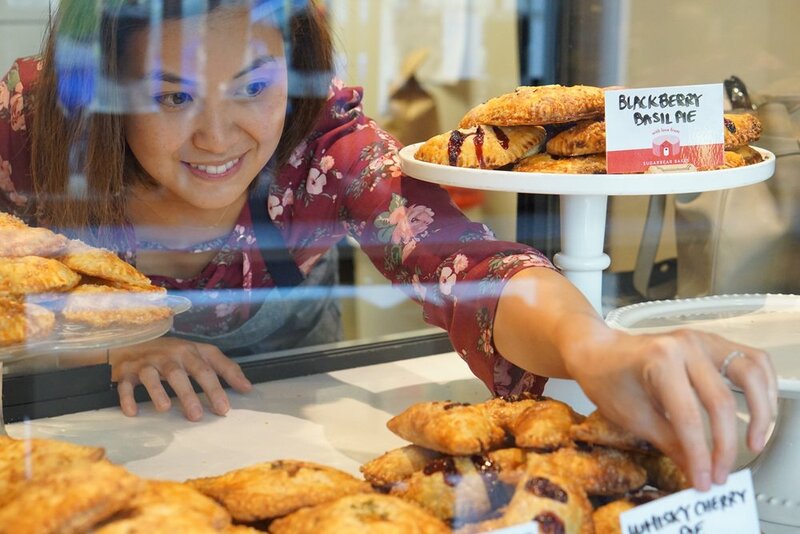 For those who don't know, I partnered with local Santa Monica coffee roasters, Cafe Demitasse, to take over their pastry case for the weekend selling my bakes exclusively. This was a few months of talks, menu planning, recipe testing, produce shopping and then pumping out schedules, marketing materials and more! I knew it would be something that would take a tremendous amount of work. What I didn't know was that we would sell out within hours of the event starting!! I'm still feeling the high and exhilaration of seeing all the smiling faces and empty plates coming back. I won't forget the near distant "mMMmms" and people telling me "SO GOOD" "DELISH" and "AMAZING!" as they walked out to carry out their weekend plans. Here are photos from the weekend along with my beloved menu. I made 380+ pieces all on my own which was the largest amount I've ever had to make! Luckily I had my hubby as my Sous Chef on baking mornings where we woke up at 2:30am to bake off everything off. My other very best friend and cousin helped me prep more pieces on Saturday night for Sunday. I seriously couldn't have pulled this off without them. Both days we sold out and within a few hours. For the next one I'll DEF need to make more items. Crowd favorites were all different surprisingly! Saturday the Matcha Maple Pavs were the last to go but on Sunday they were the first! The Breakfast Pie was a hit on both days and so were the Whisky Cherry Pies. For those who showed up and we were sold out of goodies, please message me and we can arrange a pie or pavlova commission! Thanks again everyone and can't wait to let you know about future events/plans!! xoxox.